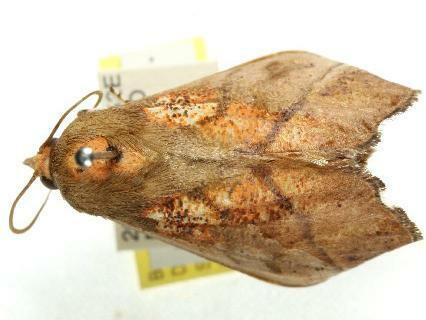 The adult moths of this species have yellowish brown forewings, each with two transverse wavy lines, and a pale basal area containing a scattering of dark dots. The brown shades to grey along the costa, the margin, and the hind-margin. 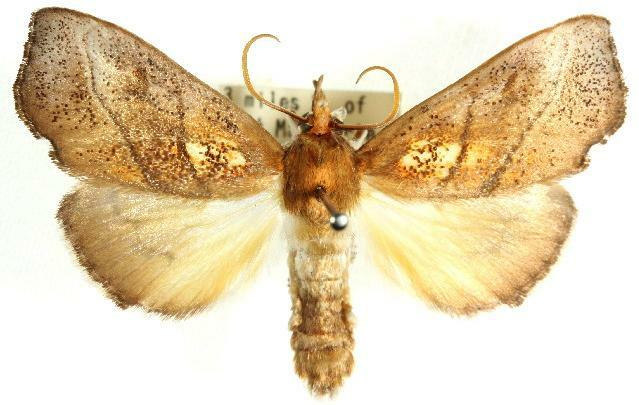 The hindwings are brown, fading to off-white at the bases, with a dark wiggly submarginal line. The forewing margins have a slight double recurve, with the tornal recurve looking like a little bite out of the wing. The head and thorax are pale rusty-red. The males have a wingspan of about 5 cms. The females have a wingspan of about 6 cms.